The first was a child's apron for our friend's little girl. She just turned 5 and is really into helping her mom in the kitchen. I have never made an apron before, and didn't have a pattern, but I figured it shouldn't be too hard. I was so glad I had this fabric on hand. It's called "Farmer John's Marketplace" by Fabriquilt. I also used some scrap red and black fabric that I had on hand. I love the bright colors and how real the fruits and veggies look! I thought it would be the perfect fabric for an apron. And, since fruits and veggies make up a rainbow of colors, I thought it would be fun to make the fabric pieces into a rainbow design on the apron. I also added a little personalized pocket in front and a small loop for a dish towel along the waist. Here is my favorite block from the start of Quilt #4. As I had mentioned in earlier posts, this will be a wedding signature quilt for my step-sister and her new husband. I am still waiting on a couple more signatures, but I have sewed most of the blocks. I absolutely love that the person who signed this block also drew a pretty flower and winding "vines". It practically matches the fabric! 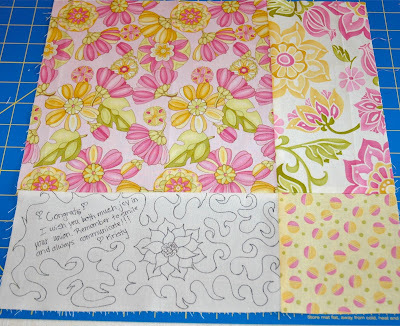 I can't wait to piece all the blocks together for the quilt top! 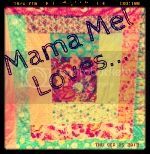 I am so happy to be working on a new quilt, and I just love this fabric too! I also love that these are really big blocks (13 inches each), so it will make it super easy to put together! 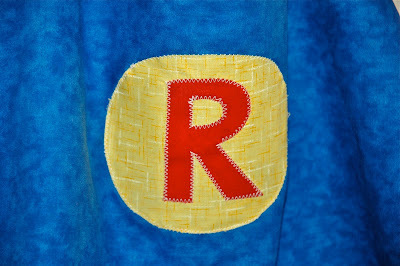 I have also been making some capes for little boys. So far, I've made one for my son and one for my nephew. My niece is having a princess party, but there will also be little boys (princes) there too! Since I helped my sister make some tutus for the girls, I thought the boys might enjoy wearing something special too. 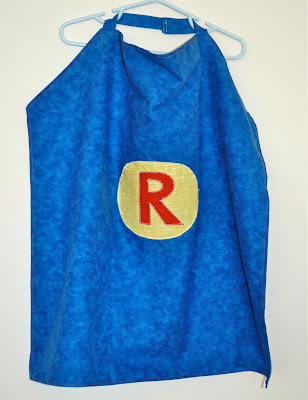 I'm thinking of adding aprons and capes to my Etsy shop once I open it back up. I see that you are crafty, so I'm wondering if you would be interested in participating in my Mom Blogger Contest for $100 Cash prize during the month of April for MissTutu.com? Thanks for considering! I think your readers will really enjoy this too since they get a free tutu making lesson! Thanks so much for taking part in the bean bags for Liberia project over at Craft Hope. Your interest is really appreciated. Thanks, too, for your fabulous tutorial!